I am a new Ubuntu 18.04 LTS user and I would like to setup ssh public key authentication. How do I set up ssh keys based authentication on Ubuntu Linux 18.04 LTS server? How do I set up SSH keys on an Ubuntu Linux 18.04 LTS server? In Ubuntu 18.04 LTS, how do I set up public key authentication? Introduction: OpenSSH is a free and open source client/server technology for secure remote login. It is an implementation of the SSH protocol. OpenSSH divided into sshd (server) and various client tools such as sftp, scp, ssh and more. One can do remote login with OpenSSH either using password or combination of private and public keys named as public key based authentication. It is an alternative security method for user passwords. This method is recommended on a VPS, cloud, dedicated or even home-based server or laptop. This page shows how to set up SSH keys on Ubuntu 18.04 LTS server. Create the key pair using ssh-keygen command. 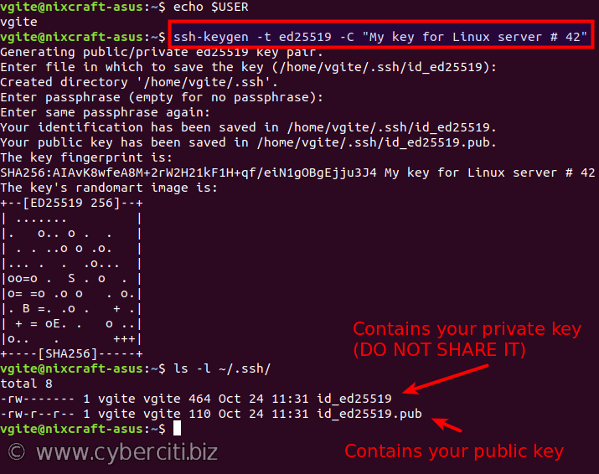 Copy and install the public key using ssh-copy-id command. Add yourself to sudo admin account on Ubuntu 18.04 server. Disable the password login for root account on Ubuntu 18.04. 202.54.1.55 – You store your public key on the remote hosts and you have an accounts on this Ubuntu Linux 18.04 LTS server. Linux/macbook laptop – Your private key stays on the desktop/laptop/computer (or local server) you use to connect to 202.54.1.55 server. Do not share or give your private file to anyone. In public key based method you can log into remote hosts and server, and transfer files to them, without using your account passwords. Feel free to replace 202.54.1.55 and client names with your actual setup. Enough talk, let’s set up public key authentication on Ubuntu Linux 18.04 LTS. $ ssh-keygen -t rsa 4096 -C "My key for Linode server"
$ ssh-keygen -t ed25519 -C "My key for Linux server # 42"
What are ssh-agent and ssh-add, and how do I use them on Ubuntu 18.04? How do I add or replace a passphrase for an existing private key? How do I protect my ssh keys? Always use a strong passphrase. Do not share your private keys anywhere online or store in insecure cloud storage or gitlab/github servers. Restrict privileges of the account. See how to create and use an OpenSSH ssh_config file for more info. How do I secure my OpenSSH server? See “OpenSSH Server Best Security Practices” for more info. 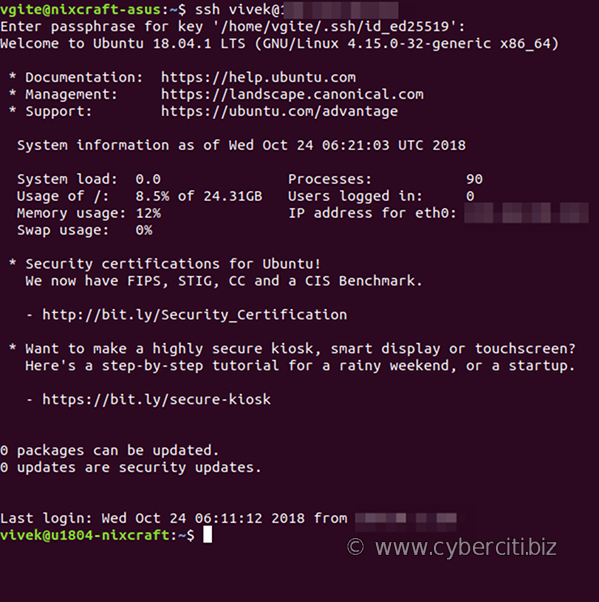 You learned how to create and install ssh keys for SSH key-based authentication for Ubuntu Linux 18.04 LTS server. See OpenSSH server documents here and here for more info.